Daniel Radcliff spotted in Cape Town climbing Table Mountain! Hollywood star Daniel Radcliff has been spotted in Cape Town! 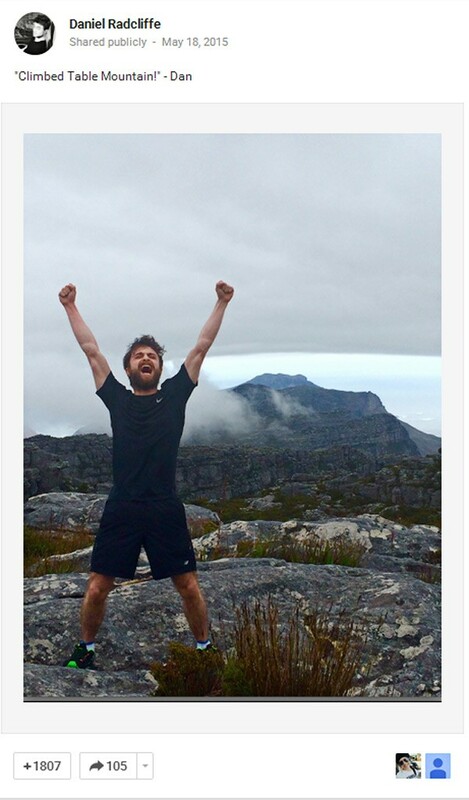 Local travel communities went ablaze on social media when the Harry Potter celebrity posted a triumphant selfie on his Google+ profile claiming that he had just conquered Table Mountain. The trailblazing fame maker is currently visiting the Mother City to shoot a new drama for the BBC titled ‘Game Changer’. The 90 minute film, based on David Kushner’s 2012 book ‘Jacked: The Outlaw Story of Grand Theft Auto’, sees Daniel taking the role of Sam Houser (co-founder of video game developer Rockstar Games). We can only hope that the film doesn’t keep him too busy for some fun in the sun. It is nice to see that the young actor is enjoying his time in the country!